I think it’s safe to say that I started the month of May in a bad place when it came to my housekeeping mindset. I was unmotivated and tired. I wanted to write about my struggles in the hopes that some others of you would be encouraged to be honest about what our everyday houses look like. I hope I’ll always laugh at the day when three- THREE – people on blogs I follow (and I only follow a few) complained about the dust bunnies in their house, and it set me off on a whole blog series about how we’re all liars if dust bunnies are our biggest housekeeping problem. It was kind of a low for me in wife and mother self esteem. But seriously, the Pinterest generation I live in is hard on us all. The result of all of this thinking about how I keep my house has surprised me, though. I thought I would come to a place where I could laugh at my shortcomings and commiserate with others. While that’s sort of been the case, the truth is I’ve wanted to improve more than I ever have before. I’ve realized that my problem wasn’t inability, but just plain being unmotivated. I realized this when I was telling someone “Congratulations on graduating from college!” Maybe a weird time to think about housecleaning? Well here’s my final “May I Tell The Truth?” moment on the blog: I am straight up jealous of students. Students get grades. I love getting grades. Students have assignments. Please, give me a concrete assignment. You know what full time moms get? No measurable feedback. Not that I am bemoaning the fact that no one tells me “you’re doing great work!” Because people certainly do. I have encouraging people in my life, as I hope all moms do. In our society, we get a lot of mileage out of tests, exams, what have you, when it comes to motivating kids ages 5-22, and then it’s time for everyone to just innately know when we’re doing a good job. Of course, there are the reviews if you’re in that kind of work position, or the raises and promotions and things like that. But even then, how many of us raised in this society are able to step back and independently evaluate what we’re doing with our efforts? We’re not trained to do that. We have tests for that. And I like academic tests! Love them. What I don’t appreciate is areas where it’s more of a pass/fail endeavor, and your work is only noticed when you’re failing. That’s the nature of housekeeping. Is any of this a good excuse to do a poor job in endeavors without measures? No, of course not. Just because no one is going to give me an A+ or C- on the state of my floors doesn’t mean I should become apathetic about how I take care of what I’m entrusted with. As I’ve recovered from that apathy a little over the past month, I’ve wondered, “where has my work ethic and pride in what I put my hands to been?” The discovery I made through my honest month of May was that my house actually does reflect my state of mind. That is not true for everyone! But it is true for me. So when my house gets chaotic and cluttery, dusty and grimy…well, watch out family, my brain is on the crazy side. Or I’m just exhausted, and my work ethic is gone for the time being. The past month or so has been one of many improvements. 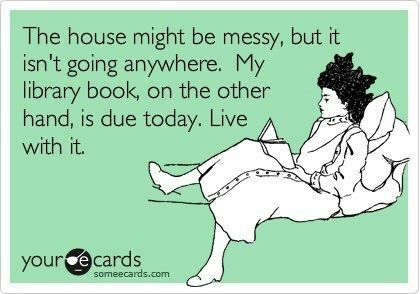 I’ve realized that I do actually care about the state of my house. The fact that three mentions of dust bunny problems made me laugh psychotically was not a reflection on the dishonesty of the writers. 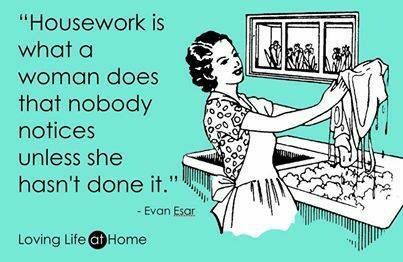 It was a reflection of how far I had sunk in my housework mentality. Please note: I still don’t really care about dust bunnies. But I do care enough to wipe off the table after every meal. I do care enough to keep the bathrooms clean, not just tidy. And that’s a movement in the right direction. There’s a new baby coming in four-ish weeks and my house will get very messy for a few weeks after that (or months). It just will. But it will get better and I will refuse to dwell in “a house that appears to be at the bottom of a toaster.” There are times when housekeeping takes a back seat. A back seat in a school bus. In fact, it should always kind of be in a back seat, right? But it should still be on the bus. So there’s what I’ve learned in May/June. I seriously just love to read what you write! You have such a way with words. It makes me think, laugh, cry (sometimes)….I just am inspired by you all the time. Love you, friend!